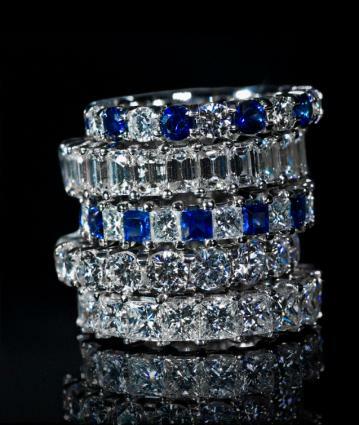 An eternity ring is a band featuring diamonds or other gemstones placed side by side in the ring in a continuous loop. The stone placement is symbolic of unending, eternal love, making this type of ring a popular gift choice for significant occasions in a couple's relationship, such as recognizing an anniversary, overcoming tremendous obstacles together, or celebrating a child's birth. 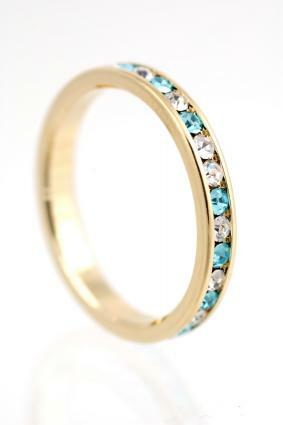 Eternity rings are very popular, so they are widely available at jewelry stores, both traditional and online. It's important to note that eternity pricing varies by size, since the quantity of stones needed to complete the designs varies based on size. It is also essential to purchase the right size, as full eternity bands with stones going all the way around cannot be re-sized. Because eternity styles require stones to be nestled closely together, small stones in compact shapes are the most popular, including round, princess, and emerald cuts. Rings do not usually mix stone shapes or sizes, in order to preserve continuity of the design. Blue Nile: Blue Nile carries an extensive selection of diamond eternity bands in a wide variety of styles to fit every budget, including channel and prong settings. Pricing starts near $1,000 -with a few options costing more than $97,000- featuring numerous selections between both pricing extremes. Ross Simons: This fine jeweler carries an outstanding collection of diamond eternity rings in many styles including channel, prong and bar settings. Prices start around $900 and go up to more than $32,000. Kodega: Kodega carries a nice selection of eternity rings, including options that feature brilliant, princess and baguette cut diamonds. For each style, you can select from platinum, palladium, yellow gold, white gold and rose gold. Pricing varies based on specific selection, starting near $2,000 with options going up to more than $8,000. When a mixture of diamonds and gemstones are used together in a ring design, the same cut is typically used on both types of stones. Couples often mix their own or their children's' birthstones with diamonds in these types of rings, or select gemstones that coordinate with other jewelry or for aesthetic purposes. Gemstone-only styles are also available. Gemvara: If you're looking for a ring with an unusual band, be sure to check out Gemvara's collection of gemstone styles. The company carries traditional channel set styles, but also offers a variety of elaborate metal designs and twisted band styles. Prices range from less than $300 for simple styles to nearly $20,000 for an elaborate platinum bezel set diamond and ruby design. Diamond Harmony: This jeweler is an excellent choice for one of the widest selections of gemstone options. In addition to diamond, blue sapphire and ruby styles, the company also carries eternity styles featuring emeralds, yellow sapphires and black diamonds. Pricing varies from under $500 to nearly $8,000. Rather than opting for a full ring with diamonds going all the way around the band, some people opt for what is referred to as a half eternity ring. This style features stones only on the front half of the band. While this style does not feature a true continuous loop, they are typically purchased with the same sentiment. 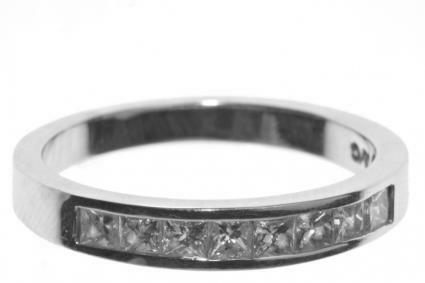 This style can be re-sized since that back of the ring is flat metal only. Brilliant Cut Half Eternity: With a total carat weight of .27, this ring from Kodega features tiny channel set brilliant diamonds. It's available in your choice of white gold, yellow gold, platinum or palladium. A size 7 in white gold is just over $1,200. Allegria Half-Band: This lovely band from DeBeers features seven round brilliant diamonds placed in prong settings. The ring has a total carat weight of 1.93 and is priced just over $14,000 regardless of ring size. Half Eternity Bezel Band: Brian Gavin carries a 9-stone band featuring .45 carat total weight of bezel set diamonds mounted in your choice of a white gold, yellow gold, rose gold or platinum setting. The ring costs just under $2,150. 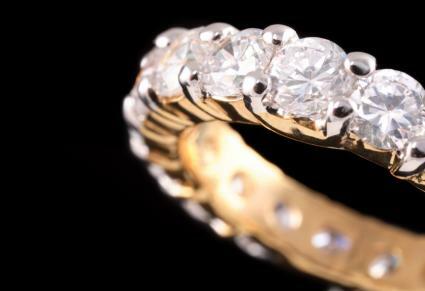 Because of the simplicity of eternity rings, there are fewer design variations than with engagement rings. Nevertheless, there are differences between styles, and couples can choose a setting, metal, shape, or other characteristic to reflect their individual preferences. Many women choose to replace either their wedding band or engagement ring with the eternity rather than wear three separate rings. If the rings are slender and do not look out of proportion with your fingers, however, it is perfectly acceptable to wear an eternity band in addition to other significant rings. Take care that the eternity band's setting is compatible with adjacent pieces; uneven settings such as prongs may rub against other rings and cause scratches. Channel settings are the most practical and can fit snugly against other rings without causing damage. Like any delicate jewelry, eternity rings should be removed before household chores, sporting activities, or other activities where the potential for damage is high. Few rings are as striking as eternity designs. Despite size and style limitations, there are many variations from which to choose. These rings help to celebrate the eternity a couple hopes to share with a love as unending as a circle.